Synopsis: I'm pushing aside the memory of my nightmare, pushing aside thoughts of Alex, pushing aside thoughts of Hana and my old school, push, push, push, like Raven taught me to do.The old life is dead.But the old Lena is dead too.I buried her.I left her beyond a fence,behind a wall of smoke and flame.Lauren Oliver delivers an electrifying follow-up to her acclaimed New York Times bestseller, Delirium. This riveting, brilliant novel crackles with the fire of fierce defiance, forbidden romance, and the sparks of a revolution about to ignite. That said, Pandemonium is pretty much nothing like Delirium, in fact, it feels like a different series entirely. 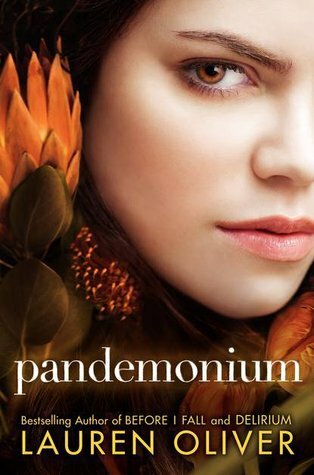 Pandemonium is erratic with a faster paced and more passionate story than Delirium. Whereas Delirium is a discovery story, Pandemonium is one about a journey.This book embodies the kids in the woods phenomenon seen in a lot of post-apocalyptic/dystopian fiction. This idea where it's mostly the teens and young adults that leave civilization to fight the status quo. Lena evolves so much as a character between this book and previous one. I adore the reincarnation of her we see in this book. She is fierce and more determined as she learns the true face of resistance and loyalty. Oliver employs a different narrative set up in the novel as well. While every chapter in Delirium was numbered and began with an epigraph, Pandemonium uses a Then and Now technique where one chapter is the before and one if the after. I like this technique because it shows the duality in Lena's personality and as the time tables converge you feel a build up. I think by changing how the book was laid out Oliver was drawing attention to how Lena's personality has changed. Things are no longer neat for her, they are all about the Then and the Now. This series is starting to remind me a lot The Uglies series by Scott Westerfeld in a way. I will say, I was able to predict most of what was going to happen, but it didn't ruin the journey. The only thing puzzling me is this book seems to imply (it's never said) that Portland is on the East Coast. This confuses me,is there another Portland or something ? Does anyone get this sense ? Side note, I really do not like these covers. I mean, what is that plant on the left side of her face. The cover looks like an eye makeup ad or something. *Thank you so much to Valerie from Stuck in Books, Jess was so happy to win this and let me borrow it ! Lovely review! I've been dying to find the time to read my copy sitting on my shelf, sigh. I'm really looking forward to reading about this 'new' Lena! This has been sitting on my shelf for nearly 3 months, I'm so glad I finally picked it up.